In Pathology, a young doctor (a bland Milo Ventimiglia) slowly discovers that the autopsy staff is playing a strange game. They’re competing to see who can pull off the perfect murder. The bodies come through their morgue, giving the other players in the game the chance to puzzle through the cause of death. Is our protagonist shocked by such behavior? A little bit, I suppose. But soon enough, he’s partaking in the games. This is a good concept, ripe for luridness and, sure enough, the filmmakers indulge in grisly autopsies and brutal murders, throwing in plenty of drugs and abuse as well. This should be a schlocky good time, but the whole thing falls flat. First-time director Marc Schölermann has a serviceable style that neither dazzles nor distracts but the script by Mark Neveldine and Brian Taylor brings the real disappointment. The two of them wrote and directed Crank a hyperactive, and ridiculously lurid, action movie that barrels forward with such a crazed energy that those with strong enough sensibilities can find themselves swept up in the ride. I found Crank a little exhausting by the end. I was overwhelmed by the sheer excess but admired the style. Neveldine and Taylor have guts and talent and I still hold out hope that they’ll turn out some great genre work. With Pathology, though, they pull back the pace which only serves to make the plotting seem sleepy. There’s a sense of matter-of-fact movement in the dialogue and plotting that makes even the most shocking hard-R content seem boring, routine, or just plain silly. The deeper and deeper Ventimiglia is pulled into the dark game, the more I felt my attention slipping away. It’s frightfully uninvolving, even for a third-rate knockoff and mash-up of Se7en and Coma. This is one seriously undercooked B-movie. Where’s the urgency? Why don’t the stakes seem life-and-death? All thrillers need a sense of danger and forward momentum. I never felt that here. Pathology is just well-shot nonsense, dull and grimy, lingering in the mind just long enough to feel uncomfortably sleazy. Tokyo!, an underwhelming triptych ode to Tokyo, presents three short films from directors who are not natives to the city: two Frenchmen and a Korean. Each film presents a distinct vision, has a few enjoyable sequences, but none of them truly satisfy. There is certainly none of the great sense of rambling unevenness married to a sense of relentless artistry that came with Paris, Je Taime, an anthology film featuring mostly great Paris-set shorts from nearly twenty different directors. The first film, Interior Design, comes to us from Michel Gondry, of Be Kind Rewind and Eternal Sunshine of the Spotless Mind. The film follows a filmmaker and his girlfriend as they move to Tokyo. The banter between the two is charming, as are the scenarios in which they find themselves, such as finding a dead cat or competing for the same gift-wrapping job. This being a Gondry film, though, I was constantly anticipating a shift into whimsy and dreading the prospects since the short unfolds with such unforced heightened, but not much, reality. When the shift arrives with the girlfriend finding a new purpose in life, I was disappointed. 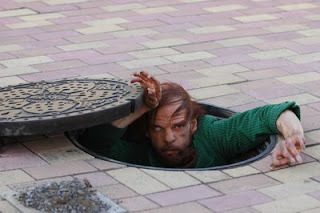 The second film is Merde from Leos Carax (who hasn’t directed a feature since Pola X in 1999), about a strange creature who emerges from the sewer and storms down a city sidewalk snatching bouquets and sandwich, pausing occasionally to frighten a baby or lick an innocent bystanders armpit, all in a mesmerizing sequence that plays out in nearly one continuous shot. When the creature’s antics turn more dangerous, it is captured and put on trial. The whole short is entertaining but it can’t match the high of its opening moments. The third, and final, film is Shaking Tokyo, about a recluse who makes eye-contact with another human being for the first time in some time. That’s all I shall say about this one, plot-wise as it both the simplest and my favorite of the three. Director Bong Joon-Ho, who also directed the fun monster movie The Host, from a few years ago, shoots his short gorgeously with great pacing and patience in its warm human comedy and poignancy. I’m not sure Tokyo! would have been worth seeking out in theaters, but now that it’s available for renting, it might be worth a look. After all, with anthologies, if you don’t like one contribution, you can skip ahead and hope you like the next one. I Love You, Beth Cooper opens with its best scene though, given the quality of the movie, that’s not saying much. The stereotypically nerdy valedictorian proclaims his love for the prettiest, most popular girl in the school during his graduation speech by uttering the movie’s title. Played by Paul Rust, the character's speech is mildly amusing. The movie’s all downhill from there. It’s a comedy, supposedly, but I laughed a grand total of once, and smiled only a few times more. Television star Hayden Panettiere plays Beth Cooper. She brings the pretty and the popular but she lacks the depth to pull off the character’s subtext. You see, popular girls aren’t perfect. Are you surprised? Beth Cooper shows up at the valedictorian’s house, where he and his best friend (Jack Carpenter) are having a small party, and proceeds to flee from her crazy military boyfriend (Shawn Roberts), nerds in tow. The movie is filled with all kinds of flat, unimaginative dialogue and self-consciously wacky behavior. It’s like a painfully awkward person who has intellectualized comedy but has no capabilities to perform it. There are also all kinds of odd fight scenes between Rust and Roberts that are ostensibly humorous and filmed in a dreary sitcom style, but the blows are matched with painfully heightened sound effects. Each punch thrown lands with a booming thump that doesn’t match the damage we see on screen or make the moment funnier. It’s not funny to watch a nerd get beaten up, at least not any funnier than watching a Hummer plow through the front of a mansion or having a teenage girl (an embarrassing Lauren Storm) admit fairly disturbing facts about her life while looking into the foreground with a blank stare. Chris Columbus directs with a flat, uninspired style that drums its way through the dull plot. Rust and Carpenter are vaguely entertaining – they have a commitment to the material that’s endearing – and there's a sweet little romance that barely develops between Carpenter and a girl played believably by Lauren London, but they can’t salvage the mess. This is a studio comedy that feels prepackaged and focus-grouped from the start. It’s light and harmless enough, I suppose, but uninvolving to its core, so desperate for laughs that it goes to the well of cheap animal gags not once but twice. The movie plays like a bad PG-13 Superbad rip-off, with best friends trying to fit in with some cool girls. But, unlike Greg Mottola’s wonderful, and wonderfully vulgar, teen comedy, Beth Cooper isn’t funny, isn’t original, and has zero emotional impact or relevance. It is a perfect closed system of a movie, originating and terminating within the Hollywood studio bubble without ever making contact with the real world. At this point, it is satisfying enough to go to a new Harry Potter movie looking for subtle differences, similar themes and scenes played in different keys and at different tempos. With six films, the series is consistently good in all aspects of its production. It’s simply enjoyable enough to be reunited with these characters, these actors, for another few hours. There’s a joy to be found in merely seeing these people again. Oh, look how they’ve grown, we can say about the child – no, young adult now – actors. More importantly, once we are absorbed into the world, we can say Look, there’s Hagrid! McGonagall! Flitwick! Why ignore the pleasures of entering into a fantasy world and enjoying its texture, its populace, its richness of imagination? With The Half-Blood Prince, the Potter films have become a firmly mature piece of fantasy storytelling. This movie cannot be dismissed as mere child’s play. It’s a beautifully languid film of great humor and emotional impact, powerful in its exploration of the ways the past intrudes on the present, the ways children of all ages will behave when hoping to carry out the wishes of a parental figure. In this film, there are two students on two separate missions for their elders. There's Potter himself, working for Dumbledore, but Draco Malfoy stands out in a wrenching and tense plotline that gives Tom Felton some real acting to do after five films of practicing his sneering. Malfoy has been chosen by Voldemort to carry out an aspect of his evil plan, which sends Malfoy into an unbearable angst. He becomes more than a stock bully, more than a proxy for his more villainous father (played by the great Jason Issacs). Malfoy gains great depth and becomes a richer, more interesting character through his torment. All of the characters get richer characterization, more emotional dialogue, this time around. The characters are older once more, sending the teens headlong into fully realized crushes and romances in addition to the usual doom and gloom of the foreboding encroaching forces of darkness. At times the film threatens to become a tad too sudsy or cutesy but pulls back at just the right moments. The lead trio – still Radcliffe, Grint, and Watson – have become more confident and skilled, once again, successfully navigating this tricky tone. Interspersed among the students' antics and the dark wizard’s evil schemes, as usual, is the great adult cast. Some, like Maggie Smith and Robbie Coltrane, have little more to do than show up once in a while to remind us of their presence and their perfect inhabitation of their characters. Others, like the always great Alan Rickman and Michael Gambon, in their best performances of the series, get more to do this time around, meatier monologues, shocking revelations and satisfying moments. Still others, like Jim Broadbent, are new to the series and fit in perfectly. Has there ever been a better cast series of movies? Every role thus far is perfectly filled and perfectly played. Taking the directorial reins once again is David Yates, who merely competently handled the last installment. Here, working with veteran – but new to the series – cinematographer Bruno Delbonnel, he creates one of the finest looking Potter films yet, casting even the lightest, funniest scenes in a haze of melancholy. The compositions are splendid; a charming early scene looks straight up the middle of a winding staircase with different characters at different heights. Later, an underwater scene plays out in a long, nearly silent, take with a beautiful dapple of green and orange. It’s ostensibly a scene of terror, and so it is, but it’s shot through with a deadly hypnotic visual charm. Throughout the film there are scenes of equal skill. It’s as if Terrence Malick was collaborating with the ghost of Orson Welles to create such skillful visual interest. It’s an approach that is vastly different from Cuarón’s work in Prisoner of Azkaban, but an approach that creates an equal effect. With an effortlessly moving camera revealing angles and crannies, gorgeous colors and palpable atmosphere, never before has the wizard world, Hogwarts specifically, looked so eminently livable, explicable, fit to explore. This is a film in no hurry, drunk on its own mood and tone. At first glance, that may seem like a backhanded compliment, and for a lesser movie it would be, but after so many hours of Potter films, I care about this world, these characters, and I feel a genuine swelling of happiness and familiarity in getting to spend more time here. It helps that the mood and tone are first-rate and evocative. We’re truly in horror territory at times, with long gliding shots down gloomy hallways, creepily distended tension, and even a few great jump moments. At other times, we’re in a great boarding-school melodrama, with easy comedy, moody students, shifting allegiances, and a sinister and strange faculty. This is a magical series indeed, with so much feeling and warmth consistently present amidst its shifting tones. The film feels of one piece, sending warm laughter and cold shivers in equal measure, sometimes shifting in seconds. (Look at the scene involving the love potion cure for an example). Near the film’s end, we are given one of the most elegantly moving scenes in the entire series, a scene that fills the screen with a soft light that, however briefly, chases away the encroaching clouds of darkness. The movie does the same. It's a fine piece of escapism, a fine piece of Hollywood craftsmanship, and one of the finest Potters. 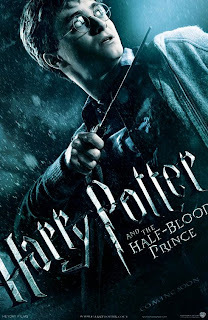 The Half-Blood Prince succeeds not just because it’s a compelling world, a gripping story, or an interesting allegory, though it is all three. It succeeds not just because it has excellent production values, great source material, and a hard-working and uniformly excellent cast and crew, though it has those too. It succeeds because we care about these characters, have seen them grow, age, and change, and are consistently presented reason to have confidence that this series will do them – and their source material – justice. 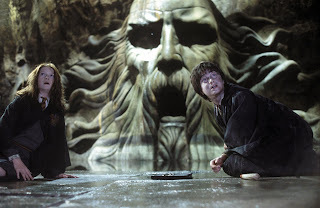 Harry Potter and the Order of the Phoenix is a dark and often scary film, satisfying in most of the usual Potter film ways with top notch design, effects, and costuming. But do I need to say the production design, special effects, and costuming are exceedingly well done? At this point it would do just as well to simply state that it’s a Harry Potter movie as excellence in these areas is now a given. It’d be more surprising if it failed on those counts. What is surprising this time around, after four consistent improvements, is a backslide. There’s pacing problems again. The movie is rushed, smashing past and glossing over what seems like important points. Other times the film moves a little languidly. This adaptation is perhaps the most awkward of the five, most likely a result of the switch in screenwriter. Steve Kloves adapted the first four books, and has adapted the last two books, but chose to take a breather with this installment, leaving the work to series newbie Michael Goldenberg. Now, I mean no slight to Goldenberg, who surely did the best he could in the time allotted and with the dual constraints of honoring Rowling’s novel and fitting within the context of an already established franchise. His adaptation, though, is just not as polished as it should be. To be fair, he was adapting my least favorite book of the series. On the screen, as well as on the page, the plot in this installment seems like so much wheel spinning. There are great concepts and visuals (we finally visit the Ministry of Magic!) but the plot is merely laying track for the impending endgame of the franchise. Putting that aside, however, and we are left with the wonderful production, and the continuingly great acting from the cast. It almost goes without saying that the kids are older and even better. Radcliffe brings a great intensity to the angst of Potter’s emotional state; after the events of the last story, he’s surely suffering from post-traumatic stress. Watson and Grint do well, as do the other kids in the cast. The adults are still a wonderful patchwork of British character actors both new and returning, though many of them pop up only long enough to say a few lines and show that, yes, they're still in the series. Speaking of new, the director is new once again. British TV veteran David Yates does an admirable job with this fantasy universe, even if he’s not taking as many risks as previous directors in the series like Cuarón and Newell. Joining the cast is Helena Bonham Carter as a pure force of unpredictability. I get the feeling the only direction she needed was "crazy witch" and she was off and running. 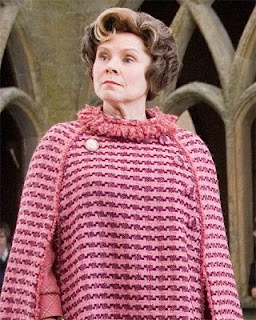 But the best new cast member in this installment is the new teacher who springs from Rowling’s writing to life: Dolores Umbridge, every horrible teacher you’ve ever had rolled into the worst teacher imaginable, a torturously warped Dahl-like figure of pleasant authoritarian cruelty. Imelda Staunton plays her to such heights of perfection that I still wish she’d gotten an Oscar nomination. 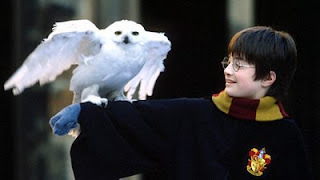 (She’s also the inspiration for composer Nicholas Hooper, filling in for the still absent Williams, to create his best piece of music for the film, one that fits Williams established mood and orchestration perfectly).Watch the way she struts across Hogwarts, using spells to pull the student body closer towards her view of proper, which has long been hopelessly warped through years of bureaucratic training to be endlessly shortsighted. Watch the way the smile stays tremulously frozen on her face when confronted with the truth that doesn’t square up with what she is certain is true. And watch the way she pleasantly stirs her tea while torturing a student. And watch her smug satisfaction as she hangs increasingly Animal-Farm-style rules on a wall of the Great Hall. Speaking of Orwell, the Ministry of Magic, especially leader Cornelius Fudge, is the major factor in the political resonance in this installment. The book and the movie were both released during the second term of George W. Bush, and I vividly recall the political themes really hitting me when I read and watched the story unfold. The erosion of civil liberties, the anti-intellectualism, the close-mindedness and willful ignorance of facts, really resonated with me, so much so that a late scene in the film that finds an oversized banner of Fudge ripped to shreds as a byproduct of battle, and another that sees Umbridge’s rules crash down, were some of the most cathartic political sights in the summer of ’07 for me. These feelings rush back to me as I watch, now tinged with an odd nostalgia. Though it seems strange to be nostalgic for something that happened only two years ago, it’s easy to see that I’m already thinking So that’s how I felt back then. But for all the positives, the movie’s only serviceable, though still a slick and exciting entry in one of the most solid of all film franchises, especially those that last this long. But then again, what’s the competition at this point, with five released titles? Friday the 13th? Police Academy? I’ll stick with Potter. The third installment of the Harry Potter series was the first to really stick. The fourth, Goblet of Fire, is the first to pack a wallop. This time under the direction of British director Mike Newell, the film is, like the others, perfect in craftsmanship but is the first in possession of a well-crafted feeling of momentum. It’s all climax, sustained for two-and-a-half hours, without ever feeling its length, constantly besting itself creating faster, scarier, and more exciting moments throughout enough set pieces to sustain a half-dozen lesser films. Benefiting from the structure Rowling used in her book – there’s a tournament going on and Harry is a participant – the movie tears from one moment to the next, always building, and never stalling. After a scene of true horror – with an elderly man investigating what should be an empty house –we start the film proper at the Quidditch World Cup, a sequence of sensational effects and gut-twisting heights. From there we have an introduction of visiting schools to Hogwarts, a suspenseful, yet whimsical, introduction to the Goblet of Fire, and then the tournament is about to begin. From there we have dragons and mer-people and ghosts and golden eggs and mazes and murders. The tension is heightened with each new feat of effects and emotion, so that by the time we get to a wailing-strings graveyard resurrection the movie is almost unbearable suspenseful. That this sequence is followed up by an evocative punch of paternal pain (it lingers long after the movie ends), a razor-sharp reveal of a double-agent, and a somber announcement shows that the movie isn’t stopping for anything. The reason this relentless entertainment never gets numbing is the variety. Sure, we have sensational action sequences and moments straight out of a genuine horror movie, but sprinkled in amongst these are touching, sweetly human, character moments. These culminate in the middle of the film at a school ball which may be my favorite sequence of all the films so far. The music swells, the characters arrive, and the dance begins. It’s a sensational feat of staging, design and costuming, sure, but it also allows the teenaged characters to be just that, in a sumptuous yet relatable setting. 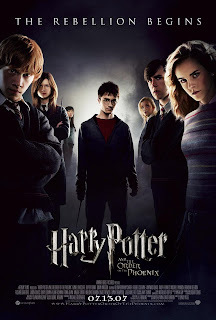 The movies are at their best when they are mere magical twists on the most muggle of feelings, like the first film’s mirror scene of longing, the classroom moments, the clashes with odd teachers and boisterous bullies, hurt feelings, wayward children and young love. But none of it, none of it, would work if it weren’t for the amazing cast that – young and old alike – grows in size and talent with each new installment. The kids, older again, and more talented too, improve once more, growing into fine young actors with infrequent clunky line readings and confident screen presences. Daniel Radcliffe has become comfortable with his relatable reluctant hero while Emma Watson and Rupert Grint have developed excellent comedic timing and wonderfully open faces that reveal turbulent emotions and thoughtful eyes. The adult cast’s comfortability with their roles grows stronger as well with Alan Rickman, with his jet-black hair and slow snapping of lines, a continuing standout. New this time is Brendan Gleeson, in a gleefully ominous role, and Miranda Richardson, a hoot as the worst kind of gossiping reporter. Also new is a slinky, serpentine Ralph Fiennes as the evil Voldemort himself, in the trappings of what is surely one of the most creepily designed movie villains of all time, right up there with Hannibal Lecter and Darth Vader. He’s truly terrifying. Mike Newell directs with a sumptuous eye for color and detail. This is a pure visual delight that strikes the perfect balance between the storybook tableaus of Columbus and the dense and busy camerawork of Cuarón. The colors are vivid with eye-popping earth tones and gorgeously magical, ethereal even, bright blues. The tone is fluid, skipping effortlessly from creeping horror, pounding thrills, melodrama, laughs, tears and kisses and back again. Hogwarts feels the most like a real school this time with the emotions, playfulness, and drama of real high school students. This is the most involving, the most fulfilling as a motion picture. It moves so fast, while still retaining both clarity and breathing room, I could have watched for much longer. It’s also the most expansive, the most dynamic, and the most dangerously menacing of the first four films. This is the Potter films at their best, successfully balancing while riding the lines between child and adult, fun and scary, tragic and tragicomic perfectly while also managing to capture Rowling’s tome’s tone. Note: John Williams sits this installment out; that year alone he’d already scored Star Wars: Episode III, Memoirs of a Geisha, Munich, and War of the Worlds. He’s greatly missed, even though his replacement, Patrick Doyle, uses a few of Williams’ themes and creates some nice musical moments of his own. 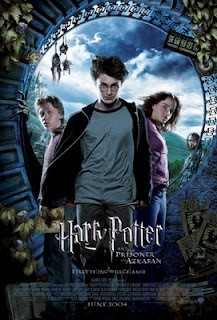 With Chris Columbus leaving the Harry Potter series, Mexican director Alfonso Cuarón stepped into the void creating Prisoner of Azkaban as a weird and wonderful installment, besting the first two installments in nearly every way, not by smashing expectations, but by taking the great work and expanding and prodding it into better and more daring places. With this movie, the series is officially not exclusively kids’ stuff. Cuarón has a restless camera that gazes about this darker plot as it shakes and slides and shimmies up and down the corridors of Hogwarts, the streets of small communities of wizards and even the dull suburban streets where Harry spends his summers. The film opens there with a delightful scene of macabre humor as Potter, in anger, expands his Muggle-aunt like a balloon (she had it coming). Then we’re off to Hogwarts where the students are all atwitter about the escaped killer, Sirius Black (Gary Oldman), who is widely assumed to be hunting Harry. 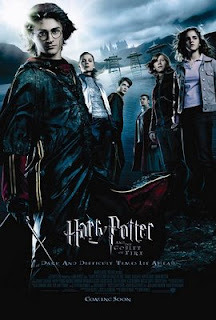 As a result of this new threat (more real-world than the more conceptual, fantasy threats of the first two stories) totally creepy guards known as Dementors, sucking all cheer and warmth from the characters – and the screen – with their very arrival, keep careful watch, casting a chill and setting the tone for fresher menace in this outing. The kids’ skills have grown once again with the central trio of Radcliffe, Watson and Grint getting more talented as well as slimmer, taller, leaner, older. The adult cast continues to satisfy, each installment adding more and more perfectly cast character actors. This time, in addition to Oldman, who brings intensity to his several nice moments in the climax, there are Emma Thompson, as a greatly loony divination professor, Julie Christie as a weary tavern proprietor, and Timothy Spall, who has one scene and makes the most of it, turning his face into a ball of ticks and twitches. But the new cast member who stands out the most is David Thewlis as the new Defense Against the Dark Arts teacher (the school seems to have that position open every year). Thewlis has a warm, easy emotional relationship with Radcliffe. In their character’s conversations there’s a sense of real connection, a building relationship of trust that starts as mentor-student and turns into something closer to father-son. They form the emotional bedrock of the film. Between films, Richard Harris, the man who so skillfully inhabited Dumbledore, passed away. He is replaced by Michael Gambon, an equally skilled but also very different actor. He brings to Dumbledore a slightly different spin but doesn’t stray too far from the conception of the character originated by Harris. I do not envy him having to walk the thin line between creating his own character and replicating what has already worked for the series, but Gambon is up to the task. As with the cast and casting, the score, design, and costuming continues to be top of the line (John Williams even uses the occasion to write the single best theme ever composed for a Potter movie), but what makes this installment so distinctive and compelling is Cuarón’s direction. He and screenwriter Steve Kloves realize they are making an adaptation, not an illustration. They are not supplanting the book, merely telling the same basic story in a different medium. The plot is tweaked and condensed to become a more cinematic rendering even if it crashes through plot points at times. And through it all is Cuarón’s relentless specificity. This is a deliriously detailed and tactile picture, packed with background information and scrupulous attention to every corner of the screen with grace notes of whimsy, like a tree shaking snow off of its branches, an aunt appearing in the background sky, and the camera floating (symbolically) twice through the gears of a clock. Cuarón allows the camera a fluid grace to glide through the world which is just as magical but has a greater realism in feeling and tone. This movie gets under my skin. The fantastical realism extends to the feelings of awakening adolescence within the young characters. Cuarón understands the yearning, the mystery, of aging and depicts the vivid mental states by understanding that magic does not make these kids any less like kids. One of the best scenes, and one of the simplest, involves a group of boys eating candy and joking with each other in a way any group of 13-year-olds might. The best effect of the film is the sound-effect accompanying a very satisfying punch thrown in the face of a bully. Cuarón makes the fantasy a wild extrapolation on the characters' uneasy, awkward steps towards adulthood, finding the intrinsic link between basic human experiences and the phantasmagorical tales we tell that is the hallmark of all great fantasy from Grimm to Rowling to Pan’s Labyrinth. This Potter is the first of the franchise to not just delight and entertain, but to sting and resonate as well. 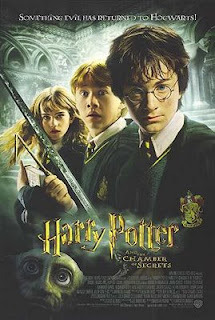 The second Harry Potter film, Chamber of Secrets, once again directed by Chris Columbus and adapted by Steve Kloves, is an interesting film, poised on the brink of the maturity the films would develop while still keeping a foot firmly in the kid-friendly zone. Darkness is starting to creep around the edges but this is still very much a kids’ film, broad and accessible with only teases of the direction the franchise will go. This is a film that simmers with an underlying creepiness, an uneasy sense of danger, but it never explodes into full-blown terror. The students at Hogwarts are threatened by a mysterious menace and the creaky camera angles and slow pans down dark hallways help to close the danger in on the characters. It’s fun to see the kids (Radcliffe, Watson, and Grint) start to grow in the craft of acting. The first film found them naturalistic with the kind of easy presence that child actors can have where they seem to be barely aware of the artifice of it all. Here, the untrained magic is gone. They’re miniature professionals by now, but it’s astonishing how skilled they are this early in their careers. The adult cast is, once again, uniformly excellent with the added bonus of the welcome addition of Kenneth Branagh playing the delightfully loopy Professor Gilderoy Lockheart. Branagh delivers hilarious line readings made even funnier by his pauses, his shifting eyes, and his easy, lopsided grin. He provides a vibrant lightheartedness matched only by the kids’ naturally buoyant and quick-witted dispositions. Together, the four of them do much to ward off the darkness of the plot that could easily have slipped the whole film into ponderousness. Once again, the score from John Williams is superb, as is the production design. The effects work is a little sharper this time around, more easily convincing than the often clunky sequences the first time around. The artisans behind the franchise have gained confidence from their work in the first film and seem to be using the confidence to great effect here, allowing themselves to push their crafts further than before. In general, the look and sound of the picture is even sharper and more refined than before (listen to those spiders in the forest, especially in surround sound), expanding with the expanding needs of Rowling’s plot. Despite that expanding plot, the adaptation by Kloves makes slightly better sense of what to cut and what to keep when pruning the plot from book to film. The film plunges into the plot proper and moves much quicker than the first film. The puzzle-solving climax of the first has been replaced with a more satisfying action beat. These were the books’ climaxes too, but this one translates better to film. Unfortunately the movie then takes too long a time to finally end, stalling through a slightly unnecessary dialogue scene and then dribbling into a puddle of sentimentality that doesn’t quite fit by excessively applauding a character (charming though he may be) that has been pushed to the sidelines for most of the plot. But no matter, the film is still an entertaining experience, faster, funnier, and creepier than the first, if ultimately a smidge less satisfying. Even though it repeats some mistakes and makes new ones, there is an admirable sense of growth and change shifting within the filmmaking, rare within franchises of this magnitude, fixing what was barely broken to begin with. This is an attitude that will serve the franchise well. The craftsmen behind the undertaking realized they did a great job the first time and, instead of growing complacent looking at the box office numbers and patting themselves on the back, decided to best themselves. If it didn't kill its momentum in its last few scenes - and was a bit more streamlined throughout - the movie as a whole would be up to the task of besting its predecessor. With this Wednesday's release of the sixth Harry Potter film, it's the perfect time to revisit the franchise from the beginning to see how it holds up and to chart how it has grown. By 2001, the Harry Potter books were a full blown cultural phenomenon, with four books published and three more on the way, each published book setting records on the bestseller lists. And they were good, too. Critics, children and parents adored author J.K. Rowling’s imaginative look at a young boy, Harry Potter, and his experiences at Hogwarts, a magical British boarding school, and the deft mixing of Dahl-like macabre with the swift thrills of a modern blockbuster. So it was only inevitable that the books would become modern blockbusters. 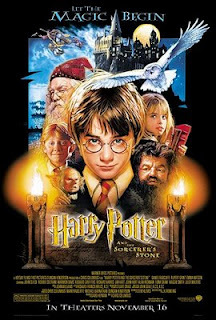 The first, Harry Potter and the Sorcerer’s Stone, was released in the fall of 2001 and quickly became one of the biggest hits of the post-9/11 weeks. Now, eight years later, I returned to this movie, wondering what I would find. The movie is older and so am I. Which one of us has changed? Despite my trepidation, the movie holds up remarkably well. Director Chris Columbus directs with a crisp, storybook style that’s rather unremarkable but has the benefit of showing off the resplendent production design by Stuart Craig. The walls of Hogwarts are vibrant and wondrous with floating props (and ghosts), shifting stairs, and a vast population of moving artwork. There’s a real feeling of magic here, awfully entertaining, but is capable of being awfully generic. More inventiveness went into designing the costumes and sets than finding ways to film them. But this is, after all, an introduction. We, as the filmmakers themselves, are getting our bearings in the cinematic world that is being spun from Rowling’s words. This is the first time we heard the notes of the tremendous score by John Williams, a work of cinematic scoring that equals his great themes for the Star Wars, Indiana Jones, and Superman series. This is the first time we’ve seen the charming child actors who are the leads. Daniel Radcliffe, Rupert Grint, and Emma Watson are almost impossibly charming – and cute – little actors, fully capable of the task before them: holding their own against a solid cast of British character actors. Richard Harris (Dumbledore), Maggie Smith (McGonagall), and Robbie Coltrane (Hagrid) are the lead adults inhabiting their literary characters with warmth and perfection. (Speaking of perfection, there’s Alan Rickman as Professor Severus Snape. In a perfectly cast film, he’s the most perfect). Among all the cast the lines are performed with perfection, tripping across the tongues in melodious British flavor. Between the score and the cast, this would be a movie great just to listen to if the visuals weren’t so strong. This is the first time the camera has shown us the accoutrements of this world, a vivid and imaginative world that has rightfully taken its place among the greatest fantasy settings in cinema history, the kind of settings that cause reverence and awe among filmgoers both young and old. This film has a childlike sense of wonder at its world, and also a more kid-friendly tone. As such, the story is slighter than the others to date; the pacing is a little awkward. What works in the book doesn’t always work on the screen. The filmmakers would gain confidence in later movies to bend and condense more than they did here. Scenes of exposition drag and the finale is a bit too puzzle-like to be truly engaging. But still, I was enchanted with the imagination of the proceedings, the red-blooded adventure, the charm of the visuals (even the few effects that now – already – feel dated), and even the nostalgia that is already settling around the film, cloaking it with a protective layer of memory. There’s real magic here, though, in the way little moments charm and big moments cause the heart to swell. It doesn’t always work moment to moment (every so often it looks like a movie about people in funny hats) but it settles satisfyingly in the end. It’s a solid start to what has shaped up to be a great franchise. Stay tuned to this very blog for further posts on previous Potters which should pop up like clockwork through the new release, culminating with a review of the new film late next week. There has been talk lately of Michael Bay as an auteur. This is healthy discussion as it does good to remind us all that acclaim is not a prerequisite for an auteur and talking about a director in such terms is not necessarily an endorsement. 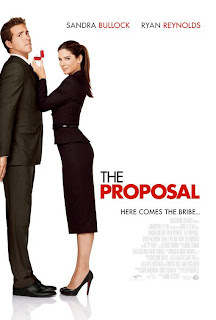 This thought came to me while watching, of all things, The Proposal, choreographer-turned-director Anne Fletcher’s third film after Step Up and 27 Dresses. She makes films in a flat, unremarkable style centering on female characters whose professional drives cause them to neglect their personal lives. Her films aren’t good – I’ve yet to like one of them – but they share this theme. Is Anne Fletcher an auteur? Maybe so. To prove it’s a true marriage to a steely-eyed government official, the two of them take off for Alaska and Reynolds’s hometown. Lots of tomfoolery occurs and it’s nice to see so much of the comedy (initially) rest on the faces of the leads. The first several minutes of the movie is fairly entertaining as Bullock and Reynolds can bring down the house with the smallest shift of their expression. It’s not so nice to see these quick-witted, likable actors saddled with a dreary plot that cares more about the coincidences and contrivances than the characters or the chemistry between them. I never bought that the two of them would fall in love. Nor did I believe Reynold’s twinkly-eyed sitcom family, including big-hearted but cold-shouldered dad Crag T. Nelson, warm and loving mom Mary Steenburgen, hottie (and nice! and smart!) ex-girlfriend Malin Akerman, and too-good-to-be-true grandma Betty White. This is all sitcom-ready casting and material, but this is no half-hour pilot. The movie drags on for nearly two hours with limp, hokey slapstick and unbelievable leaps and changes within the characters. That I uniformly liked the cast made it all the more disappointing. With this cast, and this situation, this could have been an overheated, tightly-wound screwball comedy (or at the very least a door-slamming farce) but it was not to be. The movie never gets the right momentum for takeoff. By the end of The Proposal, I began to rethink my initial thought about Anne Fletcher as an auteur. Sure, she’s returned to the same theme three times now but is blandness a distinctive enough style? After sitting through an overlong supposed comedy (you can tell it’s funny because the poster is white with red letters) that neither worked as intended or irked, I came to only one firm conclusion about Ms. Fletcher. I’m not ready to defend her until she makes a film that’s worth my time. The key to decoding Land of the Lost comes from a 70's pop song, played three-fourths of the way into the movie, that croons, among other lyrics, “summer breeze makes you feel fine.” The movie is nothing more or less than a summer breeze, a sweet-and-sour candy confection, lightweight, insubstantial, and not at all good for you. The movie takes the basic concept of the cult-favorite 70s show (and the mostly forgotten 90s series remake) and turns it into a freewheeling, goofball Will Ferrell plot with googly-eyed pop-art set design by Bo Welch and stylish direction from Brad Silberling. This isn’t a great film but it works, at least some of the time, on its own terms. Ferrell plays Dr. Rick Marshall, a washed up paleontologist who lives in shame from his outburst on The Today Show, a scene that opens the movie with a funny performance from Matt Lauer and great callbacks to a certain movie star’s appearance on the same program. Marshall is encouraged by Holly (Anna Friel), the only scientist who believes his theories about time warps, to test out his theories. They meet up with Will, an ambitious redneck carny (the always funny Danny McBride), for a routine expedition that soon encounters the greatest earthquake ever known. 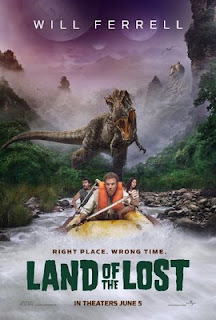 The three of them end up in the Land of the Lost, a funky world where lizard-people, monkey-people and dinosaurs coexist with other strange flora and fauna, not to mention the copious cultural detritus like a hotel, mannequins, and an ice cream truck. There’s an off-kilter charm to the set design and special effects. I was thoroughly delighted by Enik, a lizard-scientist who greets our heroes and agrees to help them return home. The plot seems almost incidental to these characters that stumble and bumble around this strange land. There’s no real reason for them to be there, so thoroughly ill-equipped to handle the zaniness around them. There’s a palpable disconnect to the style that has these people starkly standing out from the background, the semi-fake scenery and the collision of the kiddy humor and adult innuendoes. It is this very disconnect that provides an uneasy tension and a source of humor. This doesn’t play out like a good-natured spoofing of a classic show, nor does it roll out as a slick fantasy thriller. Rather, the film shuffles through a combination of the two with truly odd commitment to both halves. It’s a film that never really comes together, but the odd tension at its center (driven by a bongo and banjo score by Michael Giacchino) makes it compelling and entertaining. On Blu-ray 12 Rounds, the creaky B-movie actioner from hit-and-miss director Renny Harlin, has some clear imagery and fine booming explosions, but those do nothing to mask the horrid noise the plot makes as its gears turn. 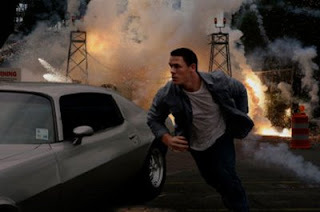 It stars John Cena – a professional wrestler with solid screen presence – as a police officer who runs afoul of a criminal mastermind (Aidan Gillen) who creates a series of convoluted scavenger-hunt style traps, most involving morality lessons, stuff that blows up, or both, for his foe to navigate. Though Cena holds his own as a competently compelling action star – it’s no worse than early Dwayne Johnson stuff like The Scorpion King – the villain never seems threatening, nor does there ever seem to be any real menace behind any of the traps. By giving us the outline – 12 rounds – in advance, it never seems to matter what happens moment to moment. The gears turn. On to the next round. I barely cared enough to shrug. 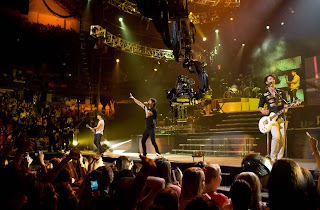 The filmed Jonas Brothers concert (aptly called Jonas Brothers: The 3D Concert Experience) is not a great concert film. There’s no thought or artistry behind the presentation (like Stop Making Sense or The Last Waltz), no immediately obvious historical importance (like Woodstock or Gimme Shelter), but it looks good. The boys are polished performers and their songs are catchy enough even though their sometimes antic movements (spins, flips, and cartwheels) ring false and their lyrics err on the side of bland. In Blu-ray, the image really shines. The lights, fireballs, water and smoke pop off the screen in vivid, dazzling ways. Freed from the burden of being forced to watch the film through a hazy 3D veneer, the image is beautifully striking. The movie’s shoddily constructed, though, with dumb clips of crazed fans and staged moments that are awkwardly inserted and quite unnecessary. A chase sequence that opens the film harkens unflatteringly to the Beatles’ A Hard Day’s Night, a film – and group – with infinitely greater energy and style. A clip package of hysteric fans seems to border on poking fun at these people who are ostensibly the movie’s target audience. Another package of clips showcases Jonas Brothers impersonators. Why are they in this movie? I doubt even the director has insight into this inclusion, with no possible motivation other than padding the runtime. During the performance itself, an oddly phallic symbol is brought out – if you see the film, you’ll recognize it – but luckily it’s discarded fairly quickly. Surely, though, someone amongst the Disney/Jonas Empire would have been juvenile enough to point it out before it made it to the tour, let alone get recorded for a film. Beyond all that, though, are great visuals and sound that dance across the screen and speakers, capable of creating a superficially enjoyable experience for the open-minded viewer. If you walk in hating the Jonas Brothers, there’s no hope for you. It’s strange, though, to note that the Jonas Brothers seem to be as slickly commercialized, and often robotically disengaged from the pure act of performance, as the Rolling Stones in last year’s equally callously corporatized Shine a Light. (Though, to that film’s credit, it also looked and sounded great, with the added benefit of some of the best cinematographers in the business and a better, more diverse, catalog of songs). Have the Jonas Brothers been hollowed out so soon by corporate interests? Let’s hope not. They have genuine talents and I sincerely hope they get a better chance to use them.